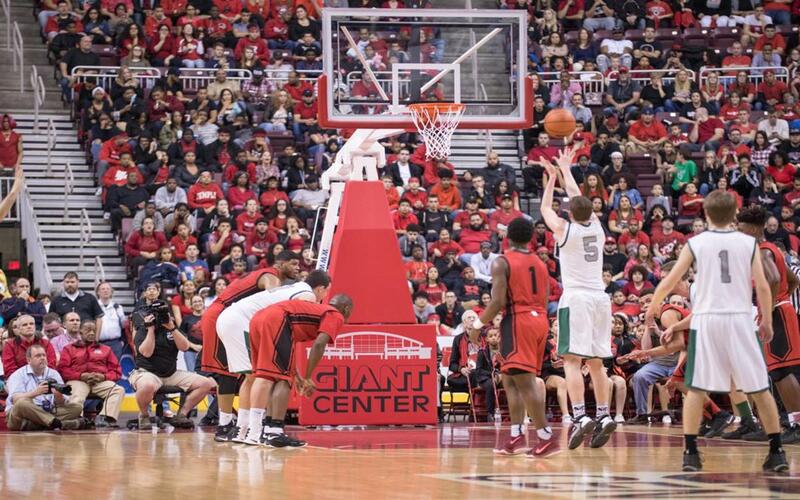 With dozens of sports tournaments successfully planned and executed each year, Hershey Harrisburg is quickly soaring to the top of the sports world. They say that it’s impossible to be in two places at once. That’s true, but hosting an event in the Hershey Harrisburg Region means that you and your teams, attendees and participants get to experience the charm of Pennsylvania’s state capital (Harrisburg) and the sights, sounds and tastes of Hershey in the same trip. Hershey and Harrisburg are just a few miles apart, and each location has a long list of facilities, hotels, benefits and amenities that are attractive to sports and events rights holders. The team at Hershey Harrisburg Sports & Events Authority (HHSE) will guide you through every step of your planning process to find the right venues and accommodations for your event. And when it comes to suggestions for post-event fun, HHSE will dial up the right call for the best activities. From the thrills of Hersheypark® to a night out on the town, the possibilities are endless. Each year, the multi-purpose Pennsylvania Farm Show Complex & Expo Center hosts a variety of exciting sports events, highlighted by the USJN Hershey Showcase and four Keystone Regional Volleyball Association (KRVA) events. 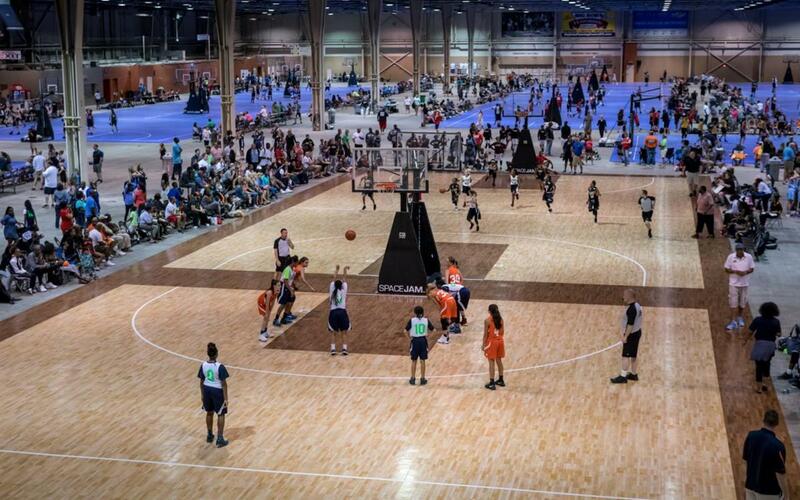 The USJN Hershey Showcase is a 4-day girls basketball event drawing more than 200 teams to compete on 20 courts, while the KRVA events each use up to 29 courts for both boys and girls tournaments. Both events take place in the complex’s 172,000-square-foot Expo Hall, and utilize SnapSport flooring that’s available for rent through HHSE. The complex is home to the Harrisburg Heat pro indoor soccer team, which plays its home games in the 7,300-seat New Holland Arena. Event organizers enjoy the seemingly unlimited setup options in a facility that boasts 7 halls, 3 arenas, banquet space and a full catering kitchen. All told, that’s nearly 1 million square feet of space under one roof. That kind of space is what led Mecum Auctions to bring its event to Harrisburg in 2014. The more collector cars you park under one roof, the more you can sell! Mecum Auctions posted more than $24 million in sales in 2018, which marked its 5th consecutive year in Harrisburg. The expo center hosts around 200 sporting events, expos and trade shows annually. 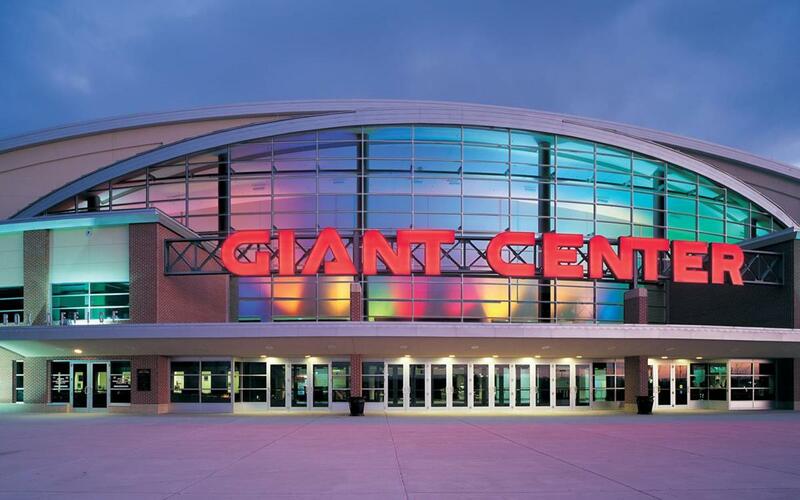 Giant CenterSM is the regular venue for the Hershey Bears® AHL hockey team. This state-of-the-art, 10,500-seat arena hosts ice shows, concerts, state high school championships (wrestling, competitive cheer and basketball), graduations, and more. The U.S. Figure Skating Eastern Sectional Synchronized Skating Championships have been held here on several occasions. The Harlem Globetrotters and WWE shows come to town regularly, and fans have been entertained by musical acts ranging from Carrie Underwood to Van Halen. The facility sports 10,000+ parking spaces. In 2016, the facility invested $4.7 million for a new scoreboard, LED electronics and production system. Take advantage of all these amenities, plus club and luxury suites and special accommodations on every level. 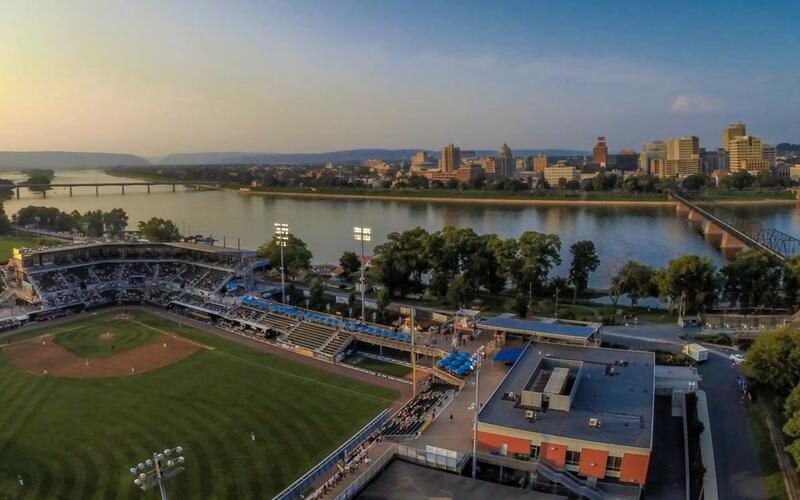 Situated in the state’s capital along the Susquehanna River, FNB Field is home to the Harrisburg Senators, the Washington Nationals’ AA affiliate. When the Senators are out of town, the grounds crew flips the field to host Penn FC professional soccer. In 2009, FNB Field underwent a major $45 million renovation project. The stadium now houses luxury seating, a high-definition field lighting system, a “Midway” activities center for families and children, 20 suites with skyline views, a new sound system, press box with digital amenities and a reserved parking lot. FNB Field is the main attraction on the 62-acre City Island, which also features a multi-purpose grass field, riverside park, launching site for river cruises, miniature golf and more. About 30 minutes away from Harrisburg and just ten miles from Hershey, Lebanon Valley College (LVC) offers a variety of grass and turf fields to accommodate large-scale events for soccer, lacrosse and more. The Hershey Harrisburg Sports & Events Authority placed the 2018 Beast of the East Flag Football National Championships at LVC, where more than 120 youth-level teams from 11 states registered to compete. 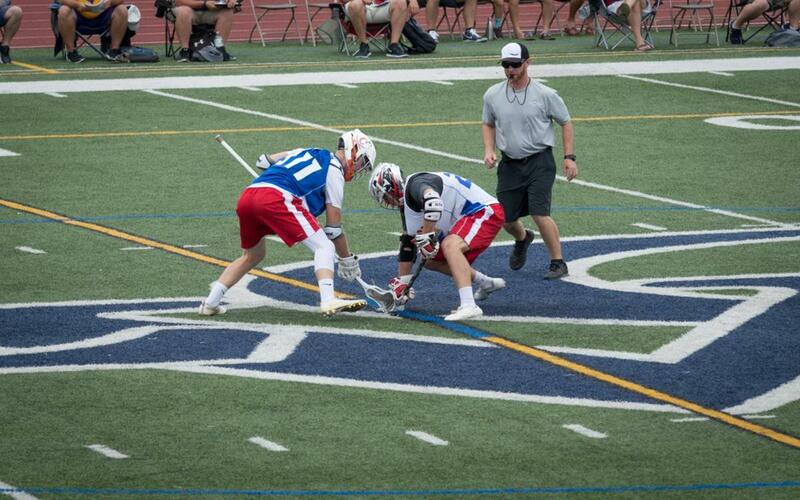 LVC has also hosted the IMLCA National Cup for several years. Need to be inside? The LVC Sports Center houses a convertible four-court arena, three racquetball courts, a four lane, 196-meter track and a six-lane, 25-meter lap pool. Athletes can train in the cardio fitness center, then rejuvenate in the locker rooms’ sauna and wellness pool. Hershey, Pennsylvania features one of the best and most versatile stadium facilities between Pittsburgh and Philadelphia. 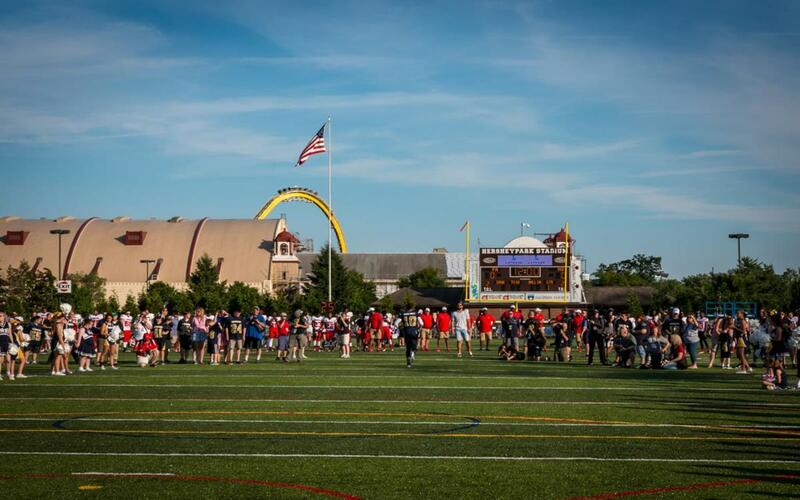 Hersheypark® Stadium hosts a variety of high school turf sports championships and concerts. Winter? No problem. The stadium hosted the 2013 and 2018 AHL Outdoor Classic events after transforming the playing surface into a regulation hockey rink. The stadium seats nearly 16,000 spectators with a concert capacity of up to 30,000. Athletes will play on neatly-groomed artificial surfaces on a 213 x 536-foot field. In summer 2018, the stadium got a facelift with a brand-new stage. The upgraded version is the same model used for iconic events like the CMA Music Festival and Lollapalooza. Big acts like Paul McCartney, Justin Timberlake and Zac Brown Band have all played this venue, and now fans will have an even better view thanks to a structure that allows for bigger screens and more performance space. Fun fact: Parts of U.S. President Dwight D Eisenhower’s 63rd birthday party were held at the stadium. Golf great Ben Hogan teed off from the stadium while the crowds awaited Eisenhower’s arrival. 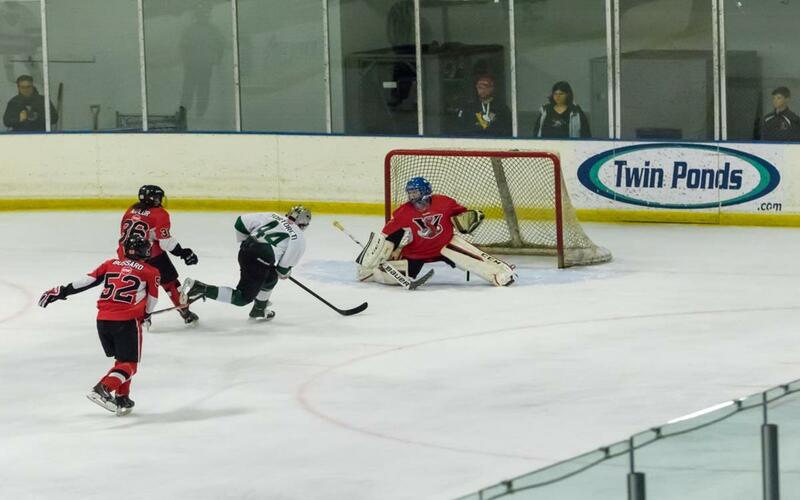 Lauded as a top hockey destination of eastern Pennsylvania, Twin Ponds East provides facilities for tournaments and entertainment. The complex covers 77,000 square-feet. The facility regularly hosts the OneHockey and Hershey Jr. Bears Tournaments on its two 200 x 85-foot NHL standard size rinks and 45 x 85-foot rink, affectionately known as the “puddle.” Off the ice, Twin Ponds East provides 9 locker rooms and an equipment shop to help teams prep for the game. Families will enjoy the center’s namesake café and access to four party rooms. Tournaments that require more than two sheets of ice often add Hersheypark® Arena and/or Giant CenterSM to the site list in addition to the Twin Ponds facility. Just across the parking lot from Hersheypark® Stadium is the historic Hersheypark® Arena, which has been the center for ice sports in Hershey for more than 80 years. Built in Milton Hershey’s “Great Building Campaign” during the Great Depression, the arena brought jobs and enjoyment to fans cheering on the Hershey Bears® prior to the team’s transition to the Giant CenterSM. 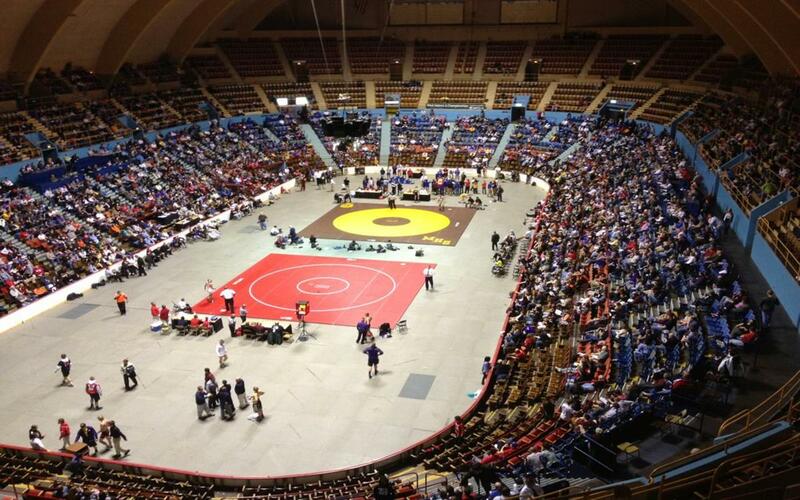 This arena holds 7,225 people. Its character, location and versatility are perfect compliments to the newer facilities that have risen on its perimeter. Did you know? Hersheypark® Arena was the scene of NBA legend Wilt Chamberlain’s 100-point game. After the final whistle blows, it’s time to explore. The many attractions in Hershey are huge draws for sports planners because they know it’s a destination well suited for family travel. It all started in 1894 when Milton Hershey founded what would become the world’s largest chocolate factory. Mr. Hershey also founded a number of facilities in his name, including Hersheypark®. What began as a picnic area has grown into a world-class amusement attraction featuring 13 (as of 2018) roller coasters, family and children’s rides and a huge waterpark. One of the region’s most visited areas is Hershey’s Chocolate World Attraction, where you can create your own candy bar, take a simulated tour of the chocolate factory, learn the ins and outs of chocolate tasting and depart for historic trolley tours. While you’re in Hershey Harrisburg for your sports tournament, get inspired by the Hershey Bears® hockey team at the Giant CenterSM. The region prides itself on being the ultimate hockey destination, and rightfully so—the team holds more Calder Cups than any other AHL team. During baseball season, catch the minor league Harrisburg Senators playing at FNB Field. Cool off from the excitement with a ride on The Pride of the Susquehanna Riverboat. This relaxing sightseeing cruise – celebrating its 30th anniversary in 2018 – offers group packages featuring live entertainment, dining and educational tours. From the initial planning process through execution on race day, Hershey Harrisburg Sports & Events Authority paved the way for an amazing first-year event. Their in-depth knowledge of local venues, relationship with key hospitality leaders and contacts with sponsors and all levels of regional government were catalysts to our success. 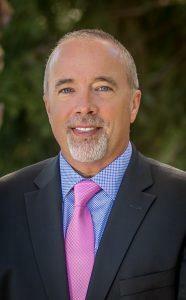 While HHSE represents a vibrant mid-major market, it operates like a big league DMO. Great partnership! Hershey Harrisburg Sports & Events Authority has made our events outstanding. They have gone beyond our expectations with video and photography support. Always helping us to improve our four events through their relationships with the Farm Show Complex and knowledge of Harrisburg. We are delighted to be in Harrisburg and so are our families who participate in our events. By Car: Getting to Hershey Harrisburg is a breeze, as the town and capital are conveniently located three hours away from major East Coast cities. Take I-76, I-81, I-83, the Pennsylvania Turnpike and Route 11 from destinations including Philadelphia, New York City, Baltimore/Washington DC and Pittsburgh. By Train: Travel to the Hershey Harrisburg area via the Amtrak, which will take you through scenic routes of Pennsylvania’s diverse landscapes to downtown Harrisburg. By Air: Just 20 minutes away from the city, the Harrisburg International Airport (MDT) travels non-stop to 12 destinations over the course of 70 flights each day. This airport offers flights with Air Canada, Allegiant, American Airlines, Delta and United.